The Boulder City High School boys basketball team will look to build off its previous 20-7 record in the coming season. Robert Vendettoli/Boulder City Review Sophomore Matt Morton goes up for a put back shot against Virgin Valley on Dec. 14, 2017. Back to lead the way for the Eagles, the senior duo of Karson Bailey and Derrick Thomas should form a solid one-two punch for the team. A second-team All-Southern Region selection last season, Bailey averaged 10 points per game while leading the Eagles in rebounds (6.6), assists (2.3), steals (1.2) and blocks (0.9). 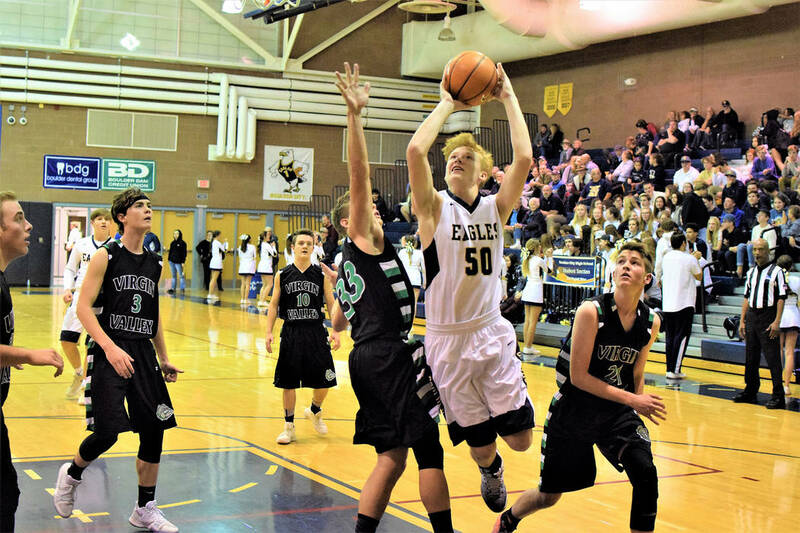 Thomas was a second-team 3A All-Sunrise League selection after leading the Eagles in scoring (12.9) while averaging 5.4 rebounds. He scored 43 points in the Eagles’ 3A postseason loss to Mojave. Looking to benefit off those opportunities will be sophomores Ethan Speaker and Matt Morton, who worked their way into the Eagles rotation as freshmen. Speaker (who averaged 5.9 points and 3.5 rebounds last season), Morton (5.2 points and 2 rebounds) and senior Elias Woodbury (3 points and 3 rebounds) are set to become key contributors to the team. The Lady Eagles basketball program is also looking to continue making strides this year and is in search of its third consecutive postseason appearance. Returning this season is a solid core from last season’s 15-11 team. Leading the way for the Lady Eagles, junior Madison Manns returns after being named a first-team 3A All-Southern Region selection last season, when she averaged 8.3 points per game. Featuring a good mixture of skill and size, 6-foot junior forward Ellie Howard returns after being named a second-team All-Southern Region selection and averaging 8.8 points. The team features two ball-dominant guards. Junior Keely Alexander was a second-team 3A All-Sunrise League selection after averaging 9.1 point per game. Rounding out the Lady Eagles core, senior Hannah Estes, who was an All-League honorable mention selection, is also expected to contribute heavily this season, along with senior forward Setia Cox and sophomore forward Kailee Fisher. Boulder City will open up the regular season on Tuesday, Nov. 27, at 4A Basic.